Kew Gardens is a small, charming neighborhood of curving streets in the center of Queens. It is similar in many ways to larger and more expensive Forest Hills. It's diverse and middle class. There are many garden apartment buildings and co-ops, some single- and multi-family houses, and a Long Island Railroad station. The neighborhood is densely populated, yet green and airy, with tree-lined streets and access to adjoining Forest Park. Kew Gardens is where all the major points of Queens seem to intersect. It meets Forest Hills to the north along Union Turnpike. To the east is Briarwood, just across the Van Wyck Parkway. To the south of Maple Grove Cemetery and 85th Avenue is the much larger Richmond Hill. Residents go to Union Turnpike and Queens Boulevard for the E and F subways run express through much of Queens. The LIRR station at Kew Gardens is in the center of the neighborhood and offers a shorter, but more expensive commute to Manhattan's Penn Station. It's about 20 minutes. The neighborhood has easy access to the Van Wyck Parkway and the Jackie Robinson Parkway. It's between JFK Airport and LGA Airport, just minutes away. Kew Garden's tiny downtown around the trains station can disappoint if you crave many types of restaurants, but Queens Boulevard and Forest Hills are close enough. What makes the downtown is the local independent movie theater Kew Gardens Cinemas. Queens Borough Hall is also in Kew Gardens, on Queens Boulevard. Forest Park is Kew Garden's backyard. 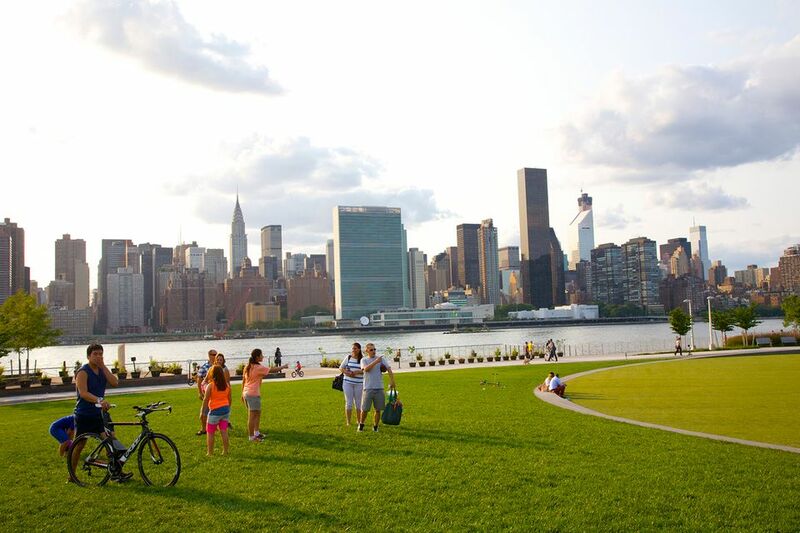 This large 538-acre urban park offers sports fields, a running track, summer concerts, hiking and horse riding trails, and a city golf course. Maple Grove Cemetery is another green space quietly open to the public. The leafy cemetery draws walkers, and the Friends of Maple Cemetery host events on its grounds throughout the year. The neighborhood was developed in the early 20th century and named for the Kew Gardens botanical gardens outside of London. The opening of the subway line along Queens Boulevard in 1936 spurred the construction of large apartment and co-op buildings. The murder of Kitty Genovese in 1964 brought negative notoriety to Kew Gardens. News reports at the time claimed that no neighbor responded to her pleas for help. Her story is used in textbooks as an example of anonymity and apathy in urban settings. Her story, however, is very much the exception to life in safe, neighborly Kew Gardens. Parking: Difficult in the downtown and there are parking restrictions on many of the residential streets.